Cosmetic Laser Warehouse stocks a full range of parts and components to repair and restore your Palomar Laser and IPL handpieces quickly and efficiently with minimal downtime to your operations. As one of the largest online resellers of Palomar laser equipment, we have ample parts in inventory for all Palomar laser systems from the EsteLux to the ICON. This means no additional wait time to source replacement parts compared with many other cosmetic laser repair companies promoting these services. 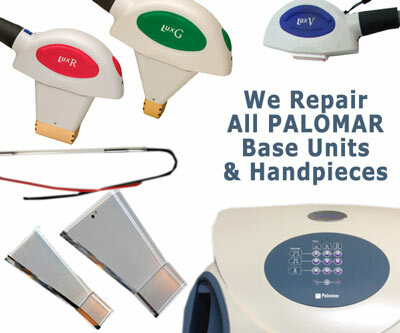 Our technicians have repaired thousands of Palomar handpieces and base units to OEM standards saving our customers on huge repair costs that would have been incurred with the original manufacturer. The majority of repairs for Palomar equipment can be completed in 2-3 days. The Palomar Vectus is diode laser that we can easily repair, including the handpiece. We can replace the Sapphire optic crystals along with any of the components within the Palomar Vectus base unit. We carry parts and components for the Vectus ensuring a quick turnaround time for our customers. Learn more about VECTUS LASER REPAIRS. We can repair the Palomar ICON and all of the handpieces for this system. Typical repairs include the power supply, touchscreen, circuit boards, computer, cooling system and more. We use OEM parts and compenents and certify all our repairs are to manufacturer specifications. Palomar StarLux base unit repairs include replacing and or repairing the power supply unit, replacing foot pedals, circuit board repairs, software troubleshooting and installation, cooling system repairs, mirror calibrations, water flow repairs and touch screen repairs. We can fully refurbish and restore your StarLux 500 or StarLux 300 to 100% working condition. Many medspas, dermatologists and other medical practitioners still utilize the Palomar MediLux laser system for a variety of their core aesthetic procedures such as laser hair removal, acne treatment, vascular and pigmented lesion removal, wrinkle reduction and more. The Palomar MediLux is a well-built aesthetic laser that with the right repairs and regular maintenance, can continue to generate income for your practice. As an aftermarket specialist in Palomar equipment we are able to quickly diagnose and repair MediLux lasers and handpieces. These repairs are the same as listed for the StarLux. The EsteLux is another well-built Palomar system that has substantial longevity if taken care of properly. The Cosmetic Laser Warehouse can repair and refurbish your EsteLux system with original Palomar parts and components. All standard repairs such as replacing the contact cooling sapphire, replacing the xenon flashlamp, power supply, polish reflectors, calibrations and more. OEM Parts Always In Stock! Palomar Icon Handpieces: MaxV, MaxR, MaxRs, MaxG, MaxY, MaxYs, MaxIR, 1540, 2940, 1064+. Palomar StarLux 500 Handpiece: LuxR, LuxRs, LuxY, LuxYs, Lux IR, LuxG, LuxV, Lux 1540, Lux 1064. Trust the Cosmetic Laser Warehouse with repairing your Palomar laser equipment. Our technicians are certified laser technicians with thousands or hours invested in repairing Palomar equipment and other aesthetic equipment. Our technicians can save thousands of dollars on otherwise costly repairs compared with the manufacturer.